The Mag-Float-20 Round Fishbowl Glass Aquarium Cleaner is recommended for use with glass, round fishbowl aquariums with a surface thickness up to 3/16”. The Mag-Float Nano Glass Cleaner (Curved) is recommended for use with glass aquariums up to 30 gallons with a surface thickness up to 3/16”. The Mag-Float-25 Small Glass Aquarium Cleaner is recommended for use with glass aquariums up to 10 gallons with a surface thickness up to 3/16”. The Mag-Float-30 Small Glass Aquarium Cleaner is recommended for use with glass aquariums up to 30 gallons with a surface thickness up to 3/16”. Features scraper attachment option. The Mag-Float Replacement Sm & Med Scraper Blade 2-Pack is sold separately. You can also use the Mag-Float Sm & Med Feeding Clip with this cleaner. The Mag-Float-35 Small Acrylic Aquarium Cleaner Float-35 is recommended for use with acrylic aquariums up to 35 gallons with a surface thickness up to 3/16”. Features scraper attachment option. The Mag-Float Sm & Med Scraper Holder & Acrylic Blade is sold separately. You can also use the Mag-Float Sm & Med Feeding Clip with this cleaner. The Mag-Float-125 Medium Glass Aquarium Cleaner is recommended for use with glass aquariums up to 125 gallons with a surface thickness up to 3/8”. Features scraper attachment option. The Mag-Float Replacement Sm & Med Scraper Blade 2-Pack is sold separately. You can also use the Mag-Float Sm & Med Feeding Clip with this cleaner. The Mag Float-130A Medium Acrylic Aquarium Cleaner is recommended for use with acrylic aquariums up to 125 gallons with a surface thickness up to 3/8". Features scraper attachment option. The Mag-Float Sm & Med Scraper Holder & Acrylic Blade is sold separately. You can also use the Mag-Float Sm & Med Feeding Clip with this cleaner. The Mag-Float-350 Large Glass Aquarium Cleaner is recommended for use with glass aquariums up to 350 gallons with a surface thickness up to 5/8”. Includes metal scraper. You can use the Mag-Float Lg & Lg+ Feeding Clip with this cleaner. The Mag-Float-360A Large Acrylic Aquarium Cleaner is recommended for use with acrylic aquariums up to 350 gallons with a surface thickness up to 5/8". Includes acrylic scraper. You can use the Mag-Float Lg & Lg+ Feeding Clip with this cleaner. The Mag-Float-410 Large Plus Acrylic Aquarium Cleaner is recommended for use with acrylic aquariums up to 400 gallons with a surface thickness up to 3/4". Includes acrylic scraper. You can use the Mag-Float Lg & Lg+ Feeding Clip with this cleaner. The Mag-Float-500 Extra-Large Glass Aquarium Cleaner is recommended for use with glass aquariums up to 500 gallons with a surface thickness from 3/4" to 1-1/4". The Mag-Float-510A Extra-Large Acrylic Aquarium Cleaner is recommended for use with acrylic aquariums up to 500 gallons with a surface thickness from 3/4" to 1-1/4". The Mag-Float-1000 Super Mag Float Glass & Acrylic Aquarium Cleaner is recommended for use with glass and acrylic aquariums with surface thickness from 1-1/2" to 2". The Mag-Float Sm & Med Scraper Holder & Acrylic Blade can be added to the Mag-Float-35 Small Acrylic Aquarium Cleaner and the Mag-Float-130A Medium Acrylic Aquarium Cleaner. NOTE: It will only work with the newer versions that have the Scraper receptacle. 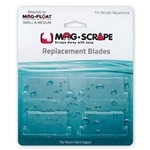 These replacement blades are for the Mag-Float Sm & Med Scraper Holder attachment that can be added to the Mag-Float-35 Small Acrylic Aquarium Cleaner and the Mag-Float-130A Medium Acrylic Aquarium Cleaner. Includes four acrylic blades. These replacement blades are for the Mag-Float Lg & Lg+ Scraper Holder attachment that can be added to the Mag-Float-360 Large Acrylic Aquarium Cleaner and the Mag-Float-400 Large Plus Acrylic Aquarium Cleaner. Includes four acrylic blades. Two Mag-Float Replacement Scrapers for the Mag-Float-400 Large Plus Glass Aquarium Cleaner w/ scraper. The scraper can also be used with the NEW STYLE Mag-Float-350 Large Glass Aquarium Cleaners. The NEW STYLE Mag-Float 350s have receptacles for the Scraper to slide into. Two Mag-Float Metal Scraper Blades for the Mag-Float-30 Small Glass Aquarium Cleaner (w/ scraper option) and the Mag-Float-125 Medium Glass Aquarium Cleaner (w/ scraper option). 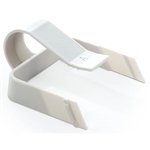 The Mag-Float Sm & Med Feeding Clip can be added to the Mag-Float-30 Small Glass Aquarium Cleaner, Mag-Float-35 Small Acrylic Aquarium Cleaner, Mag-Float-125 Medium Glass Aquarium Cleaner and the Mag-Float-130A Medium Acrylic Aquarium Cleaner. To use the feeding clip you just place a piece of seaweed, spinach or other vegetable in between the Clip and the Mag-Float. Then watch the fish indulge! The Mag-Float Lg & Lg+ Feeding Clip can be added to the Mag-Float-350 Large Glass Aquarium Cleaner, Mag-Float-360 Large Acrylic Aquarium Cleaner and Mag-Float-400 Large Plus Glass Aquarium Cleaner. To use the feeding clip you just place a piece of seaweed, spinach or other vegetable in between the Clip and the Mag-Float. Then watch the fish indulge! NOTE: This will only attach to the new versions that have the clip holder. The Mag-Float Replacement Paad/Felt for the Med Glass Cleaner is for the Mag-Float-125 Medium Glass Aquarium Cleaner. The Pad/Felt contains one algae pad and one felt pad (for the exterior side). For glass aquariums only. 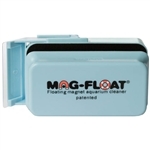 The Mag-Float Replacement Pad/Felt for the Lg Glass Cleaner is for the Mag-Float-350 Large Glass Aquarium Cleaner. The Pad/Felt contains one algae pad and one felt pad (for the exterior side). For glass aquariums only. The Mag-Float Replacement Pad/Felt for the Lg+ Glass Cleaner is for the Mag-Float-400 Large Plus Glass Aquarium Cleaner. The Pad/Felt contains one algae pad and one felt pad (for the exterior side). For glass aquariums only. 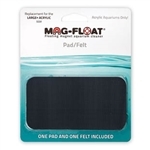 The Mag-Float Replacement Pad/Felt for the Lg+ Acrylic Cleaner is for the Mag-Float Float-410 Large Plus Acrylic Aquarium Cleaner. The Pad/Felt contains one algae pad and one felt pad (for the exterior side). For acrylic aquariums only. The Mag-Float Replacement Pad/Felt for the Super Glass & Acrylic Cleaner is for the Mag-Float-1000 Super Mag Float Glass & Acrylic Aquarium Cleaner. The Pad/Felt contains one algae pad and one felt pad (for the exterior side).